The new work by David Dorfman portrays the importance of pursuing connections. Fresh from working on the Broadway show “Indecent,” veteran choreographer David Dorfman returned to the Bates Dance Festival stage Thursday night to premiere a new work that plays a lot like musical theater. “Aroundtown” is an hourlong, widespread multimedia and interdisciplinary work that seeks to portray the struggles and joys of contemporary individuals and communities during difficult times. Its level of abstraction, as these sorts of works go, is fairly modest, and despite a bit of distancing self-consciousness, the piece is effective in suggesting some of the costs and benefits to humans in continuing to pursue connection. 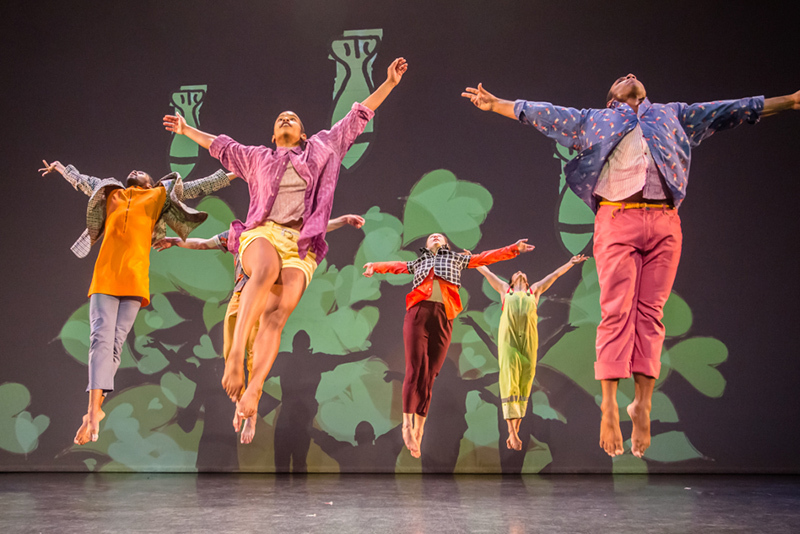 Live onstage original music, under the direction of Sam Crawford, guides the audience through various segments, some very active with six dancers in colorful, loose-fitting “street” costumes filling the space. The push, pull, hop, swirl, entanglement and recoil of vigorous modern-dance movement, familiar to fans of Dorfman’s past work, demand attention. The characters seem restless but resilient as they suffer and celebrate. Edgy, thumping musical riffs power some of the segments while other, more gently lyrical moments are framed by haunting drones and arpeggiated electric guitar surges. Vocals, mostly delivered in an alt-folk vein, tell of states of distress, longing, reminiscence and commitment as dramatic vignettes play out at center stage. Videos, consisting of childlike paintings and settings for toy animals and soldiers, play behind the dancers who are mostly side and back lit. Monologues, spanning a range of emotions from angry to playful, give several performers a chance to verbally embody the visual action. “I see you … we match … I hate you,” recited by Jasmine Hearn, and “I want to be around heaven,” delivered by Simon Thomas-Train (a standout actor/dancer), are lines around which an often nearly sculptural tableau of performers form and reform. A variety of emotive pairings and solos by dancers add to the drama. Some overt jokes and bits of verbalized direction do seem, at times, oddly placed. “I will wait for you forever,” a lovely vocal by Liz de Lise, comes near the close as the action settles down. Fans of David Dorfman need not wait longer for this new work which, particularly in its quieter, lyrical moments, delivers on its most heartfelt ambition.